Take a Hike or Bike Through the Beautiful Adirondacks! Adirondack hiking trails are plentiful in this region. Closer to the village, Prospect Mountain offers breathtaking panoramic views of Lake George, NY to hikers, bikers and motorists alike. Buck Mountain on the east side of the lake is also a wonderful climb. The Warren County Bikeway (a 10 mile span) starts at the southern tip of Lake George and ends in the Town of Queensbury. This bikeway meanders through the mountains away from the streets and highways. Most of this trip is flat with some gently rolling hills. The Warren County Mountain Bike Trail System offers 180 miles of trails covering all ability levels. 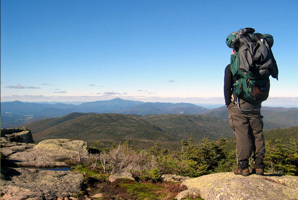 As for Adirondack hiking and camping experiences, Lake George offers convenience in a beautiful environment. The mountain roads stretching west from the Bolton Landing area’s are still dirt and provide rigorous but memorable mountain biking trips. The back hills not far from Lake George are full of beaver dams, native brook and trout streams. There are also many areas for rock climbing in the Lake George area. As the saying goes, Lake George has it all. Lounge around the pool or the lake and just do a lot of nothing. Or flex your muscles among the Adirondack hiking trails or on the biking trails. To each his own.